LED, incandescent, and CFL lights: Solar power in the developing world. People in developing countries are leapfrogging our 19th century technology. An M-Kopa solar system, in Kenya. There’s a simple technology that transforms our lives every day, and yet we rarely give a passing thought to its existence (unless of course it flares out at an inopportune moment): the light bulb. And yet for more than a billion people in the developing world who lack access to electricity, this simple device can make an unimaginable difference. We’ve been reaping the benefits ever since. Consider this: Night drifts in through the window, and the room darkens. You casually stroll over and flip a switch, a movement so ingrained you barely notice you’ve done so. The bulbs blaze, the dusky shadows outside disappear. Your home once again turns bright as day. You read a book, maybe cook dinner, and the kids in the house settle in to do some homework. But for people around the world who can’t flip that switch, their lives are ruled by that great ball of flaming plasma passing across the sky. To the extent that they do illuminate their homes after the sun dips below the horizon, they rely on candles or kerosene, both of which are expensive, dangerous, and polluting. In some areas of Africa, people spend from 10 to 30 percent of their income on refilling kerosene lamps, which are little more than tin cans with an open flame. Burning them releases millions of tons of carbon dioxide per year and contributes to climate change. And igniting them in a closed home can equate to smoking a couple of packs a cigarettes a day. Smoke from burning kerosene irritates the eyes, so students extinguish them instead of doing homework. On the flip side, a family with a light bulb is a family with opportunities. Women can set up small shops in their homes, for instance, to sew or cook for extra money. Kids can study for school: A light may keep a girl or boy from dropping out. Families read, or may use the light to set up classes to teach others to read. A shop owner keeps his or her store open longer, earns more money, sends more kids to school—and those kids can then use the glow to read in the evenings. That’s why there are dozens of organizations around the world dedicated to nothing more than making sure that people have access to light. Many of the communities without access to regular electricity are now leapfrogging our ancient 1800s technology. The ubiquitous incandescent bulb, the one perfected by Edison more than a century ago, basically works via a filament that, when electricity passes through, burns hot enough to emit light. But about 95 percent of that energy is wasted as heat. As a result, incandescents are being phased out by many governments; the U.S. slowly began phasing them out in 2012. Compact fluorescent lights, or CFLs, were invented in the 1940s and are significantly more energy efficient. But for decades their cooler tone turned off many consumers (though the color has gotten warmer, and CFLs have been replacing incandescents). Light-emitting diodes, or LEDs, are the top new technology in lighting. When electricity is applied to an LED, electrons jump from one layer of material within the diode to another and give off light. They’re hardy, they last for years, and they’re incredibly energy efficient. The problem is that white LEDs are pricey. Americans might weigh the options and decide: Why shell out around $10 to $20 for an LED, even if it will last perhaps 25 times longer than the cheap incandescent? But nearly unbreakable LEDs are easily paired with solar power, and so in poor communities, what seems excessive to us becomes a long-lasting investment that bypasses both inefficient incandescents and the lumbering power grid. Some nonprofits, such the Light Up the World Foundation, pair solar panels with LEDs. The organization Solar Sister provides women in Africa with training, marketing, and an inventory of solar-powered light bulbs. 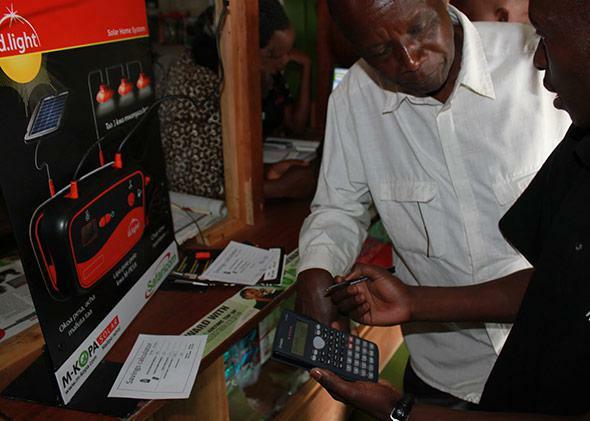 M-Kopa in Kenya provides a financing scheme along with the requisite technology; the organization sells an entire home system with solar panels, lights, and a cellphone charger, for about $200. Customers pay as little as about 45 cents a day and can pay off the debt in a year. Companies are also focusing on the design of that LED light in the first place. D.light Solar provides rugged lights and chargers to M-Kopa and has already sold more than 1 million units. Nokero, founded in 2010 (the name comes from “no kerosene”), just this October released the latest version of their solar-powered lanterns. The elaborate $45 version can either plug into the grid or recharge via solar panels, and it includes outlets that allow users to power their mobile phones. Their simplified solar-powered bulb is only $5 to $6, the cheapest on the market. They’ve already sold hundreds of thousands of units throughout the developing world through commercial distributors, nonprofits, and governments. It may seem like a throwaway technology to us. But for perhaps 20 percent of the world population, a functioning, reliable light bulb is a godsend.